We have some really good news and some deeply disturbing news. 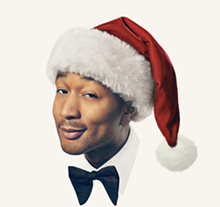 Good news: R&B crooner cutie and piano man John Legend made a Christmas record. The bad news? Christmas is less than 20 days away, and we have not done our Christmas shopping yet. Anyway, let’s focus on the positive, because that’s what Legend and his Twitter queen babe wife Chrissy Teigen (aka definitive #RelationshipGoals) would want us to do. A mix of holiday favorites and original tracks, A Legendary Christmas finds the newfound EGOT winner (that’s Emmy, Grammy, Oscar, and Tony — or all four major annual American entertainment awards, a rare and coveted feat) decking the halls with Stevie Wonder, Esperanza Spalding, and producer Raphael Saadiq.